-Our private beachfront holiday villas are located on the border of a clear, exclusive and comfortable holiday site 3km, away from the village of Ildir. Our beachfront vacation villas are directly facing the beach thus providing a panoramic view of the sea. -Our beautiful vacation villas are surrounded by a 1000 m2 green grass garden with an open terrace of 20 m and a roofed terrace of 20 m2 veranda.From here,we will have a panoramic and marvelous sea view. The villas have a beautiful private sandy beach. The livingroom (30m2) in each villa has a satelliteTV and is fully furnished. which can accommodate a total of 10 beds (double and single beds). In each villa,there are 3 bathrooms.The main bathroom has a WC, bathtub and water boiler.The 2 smaller bathrooms has a shower and toilet. There is also a common shower in the garden. In the garden,there is a common washroom with a washing machine,iron and ironing board. a wonderful BBQ meal. Our barbeque and grill sets are available for your use. As you can see from the pictures on our website, there is a private beach/sand pool just in front of our villas with sunloungers and umbrellas all around, you will enjoy the cool breeze from the sea during your sunbath. - Shops and restaurants are within 200 to 2000 m from the villas. 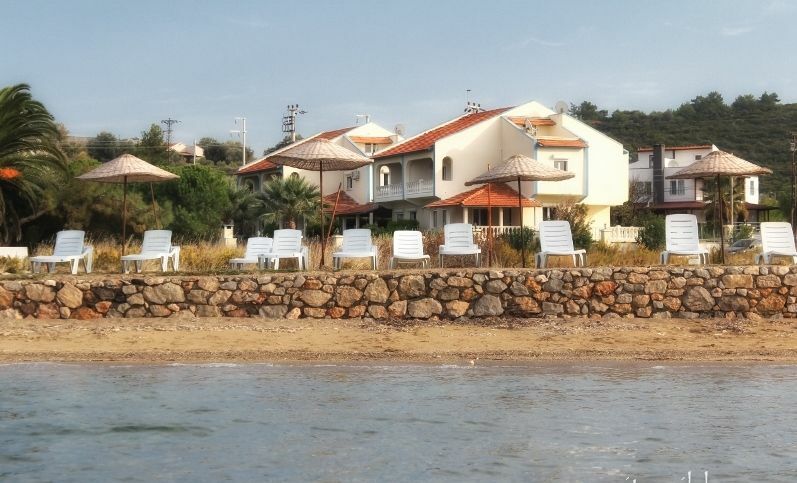 -The beach is 50 m directly in front of the villas and is within walking distance. 3km from the village of Ildır. 15km from Alacati (one of the world\\\'s most famous surfing centre), 12km from Ilica, 18km from Cesme, 75km from Izmir, 170 km from Ephesus, 220 km Pergamum, 320 km Pamukkale and 80km from the airport (Adnan Menderes). -Easy access by buses to Ildir village, Ilıca and Cesme every 30 minutes. There is also a daily bus service to Izmir which runs every hour. Car rental and transfer to and fro the Airport to our villas are available upon request. All prices are per villa per week (in Euro - €) for groups of 4, 5, 6, 7, 8,9 and 10 persons. The prices include electricity, water, gas and one set of bedding per person (given on arrival).Basic price (for 1-4 person) is 650€ for high season (01 Jun -30 Sept), 400 Eur. for mid-season (01 Apr - 31 May and 01. Oct - 30.Nov), 250 € for low-season (01 Dec. -31 Mar). For each additional person we charge 65€ for high season, 40€ for mid-season, 25€ for low-season. 40 Euro is added to rental price for final cleaning. The housekeeping service will be made before the guest arrival. (The villa will be cleaned and arranged before the guest arrive ).There is no housekeeping service during the guest\\\'s stay.If needed, this can be arranged with an extra cost.Towels have to be brought by the guests.Towels are available for rent. - In order not to have a conflict with the bookings, guests can check- in after 14.00 pm and check- out on or before 11.00 noon. will take effect from the day before. Electricity or gasoline expenses (in case heating is needed),which rarely occur at the pre -or after seasons,will be at an extra charge based on the usage during your stay. Meanwhile 35 Euro is added to rental price for final cleaning. All shops and restaurants mentioned are private institutions. We don\\\'t have any influences over their operations. We are, therefore not responsible for any loss,damage,claim or injury that may either be directly or indirectly arised from the services of the employees or any thirdh parties. Private Seaside Facilities As you can see from the pictures on our website, there is a private beach/sand pool just in front of our villas with sunloungers and umbrellas all around, you will enjoy the cool breeze from the sea during your sunbath. In addition, we have also installed air-conditioners in our villas. You can use the air-conditioner optionally when you need cool weather by paying for the extra electricity consumption. "TRES PROPRE, CALME, MAGNIFIQUE VUE, LIEU PARADYSIAQUE.PROPRIETAIRE TRES GENTIL .MERCI BCP." In addition, we have also installed air-conditioners in our villas. You can use the air-conditioner optionally when you need cool weather by paying for the extra electricity consumption. The prices include electricity, water, gas, housekeeping and one set of bedding per person (given on arrival). Towels have to be brought by the guests. - Upon arrival a deposit of 100 - € will be collected for possible damages to property and breakages of equipment and/or the loss of keys. The damage deposit is fully refundable on your departure, provided there is no breakage, damage and missing items during or after your stay. - Electricity or gasoline expenses (in case heating is needed), which rarely occur at the pre- or after seasons, will be at an extra charge based on the usage during your stay. - All distances quoted are only an estimation and should be used as a general information. - Shops and restaurants are within 200 to 2000 m from the villa. -The beach is 50 m directly in front of the villa and is within walking distance. 3km from the village of Ildýr. 15km from Alacati (one of the world's most famous surfing centre), 12km from Ilica, 18km from Cesme, 75km from Izmir, 80km from the airport (Adnan Menderes). -Easy access by buses to Ildir village, Ilýca and Cesme every 30 minutes. -There is also a daily bus service to Izmir which runs every hour. Car rental and transfer to and fro the Airport to our villa are available upon request.visit our website for more information. In order not to have a conflict with the bookings, guests can check-in after 13.00 pm and check-out on or before 12.00 noon. If the guests want to check-in earlier than 13.00 pm, they accept that their reservation will take effect from the day before.